[u,t] = gensig(type,tau) generates a scalar signal u of class type and with period tau (in seconds). The following types of signals are available. gensig returns a vector t of time samples and the vector u of signal values at these samples. All generated signals have unit amplitude. 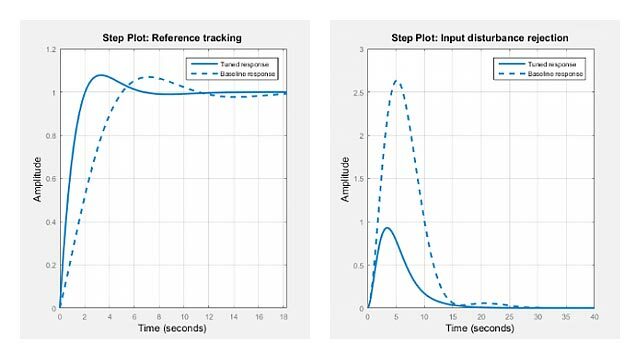 [u,t] = gensig(type,tau,Tf,Ts) also specifies the time duration Tf of the signal and the spacing Ts between the time samples t.
You can feed the outputs u and t directly to lsim and simulate the response of a single-input linear system to the specified signal. Since t is uniquely determined by Tf and Ts, you can also generate inputs for multi-input systems by repeated calls to gensig. Generate a square wave with period 5 seconds, duration 30 seconds, and sampling every 0.1 second.